We keep saying on Android Review Center that Android Smartphones are there to make our lives better, from work to play to safety to home and family. In fact, everything you need is right there on Google Play, an app for every need. But lately we gave little attention to the kiddy side of Google Play. Actually, apps for kids are very important and not always from the reasons we might think. Apps for kids (at least, good apps for kids) help kids develop, from cognitive skills to hand to eye coordination, straight forward schooling and so on. Of course, giving tired parents a few moments to rest is also vital. 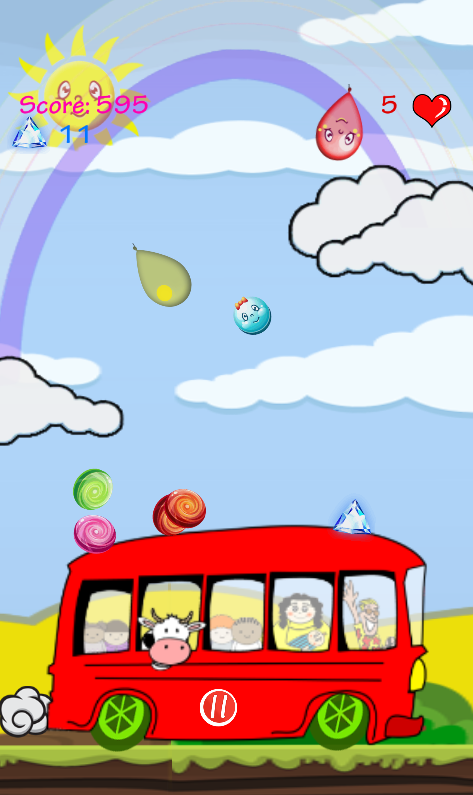 This is why Candy and Balloons, a new bus game by little apple is important, for parents and kids alike. It's a game for kids aged two to five, with kids even older than six also showing a keen interested for this completely free game (there is a small ad section, but that is unavoidable). What is Candy and Balloons all about? This app has been made too appear in the form of interactive video, lovingly drawn in cartoon style. 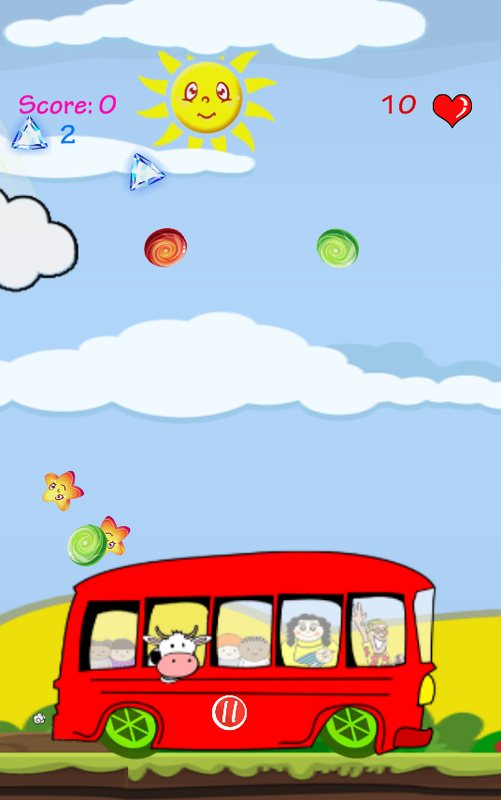 The theme of the game is the red bus that travels through the colorful scenes. In the background you can hear the beloved children's song, "The wheels of the bus ..."
The game hides a number of interesting and fun surprises. The player touched certain elements falling behind the bus and is awarded with funny and surprising interactions. 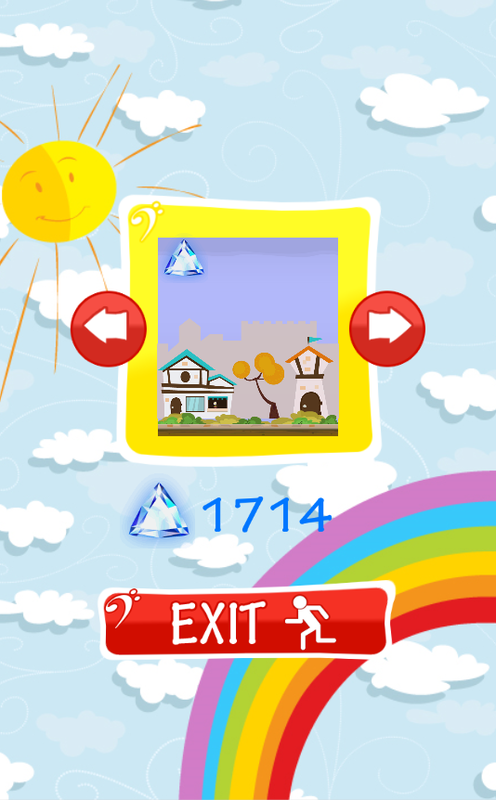 The player touch or cuts like a ninja to destroy the candy, creatures and score points. Avoid balloons and play as long as you have game life remaining. Collect crystals to unlock additional scenery.. This colorful game draws kids attention and its cartoonish style makes them glued to the mobile device, while developing their coordination, color and depth perception along with a sound track that is both entertaining and is a learning experience in itself. The game also teaches the kids about exploring, touching things and learning about consequences. The kids can touch everything and interact with almost everything in the game, starting from birds to candy to almost everything else. A game that draws children in, teaching them about exploring while drawing for them a safe, cartoonish environment with great children's soundtrack really approaches the ideal of a perfect kids game, for children and parents alike.